Liking this recipe; simple and easy plus it's tasty, too! 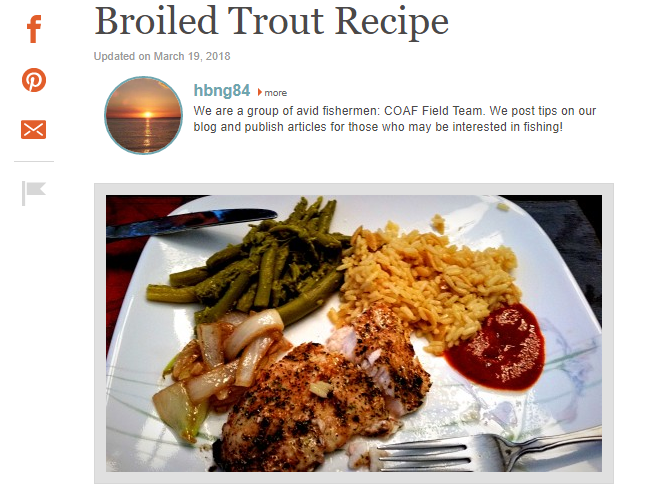 Broiled Trout Recipe. - Dry off fillets with a paper towel, and then lay skin side down onto a dish. Coat with olive oil. Combine salt, pepper, oregano, thyme, and parsley, and then lightly sprinkle onto the fillets. Let sit one hour before cooking. - While the fillets sit, mix soy sauce and lemon into a bowl, and then refrigerate. You will only need a little to baste the fillets just prior to cooking; the remainder will be used as a dipping sauce. - Set the rack in the oven so the fillets sit 4"-6" from the heat source. Then, preheat the oven, setting it to "High Broil" or "Broil". Do this prior to the hour is up after you set the fillets aside as noted in Step 2. (Example: Our oven takes 10" to preheat; therefore, we started preheating the oven 50" after seasoning the fillets). - While the oven is preheating, coat the broiling pan with olive oil, and then place the fillets skin side down onto the broiling pan. Don't coat the skin with oil; this will make it easier to separate the meat from the skin at serving time. - When the oven is preheated, set the broiling pan with the prepared fillets onto the rack you set 4"-6" from the heat source earlier. And then, set the timer for 5". - At 5", check the fillets. If they are white and flaky. Turn off the heat, and let sit in the oven for 2". If they are not, leave the oven on broil, and check the fillets in another 2". Repeat this until the fillets are white and flaky. When they are done, turn off the heat, and let sit in the oven for 2". - After sitting in the oven with the heat source off for 2" remove from the oven. Using a spatula, separate serving size portions from the skin and place onto plates. - Serve with asparagus, rice pilaf (or dirty rice), and saute'd onions and garlic. Add a little Sriracha Sauce to spice things up, and don't forget the Soy Sauce/Lemon dipping sauce!